First impressions of Sandakan were not good. In its heyday it was a thriving commercial port. There is a lot of new development on the outskirts of the city but the centre was pretty dilapidated.We checked into our hotel and went off to explore the waterfront and things got a little better, some new development going on, a nice market on the harbour side where the fishermen were unloading their catches to the waiting stallholders. Sadly the delicious looking fish the men were unloading from the boats didn’t seem to make it to the fish restaurants on the quayside. They all seemed pretty average at best. For our few days in town we ate mainly at the excellent Indian restaurants around the centre of the old town. After a couple of days in town we set off for Sepilok around 15 kms away. 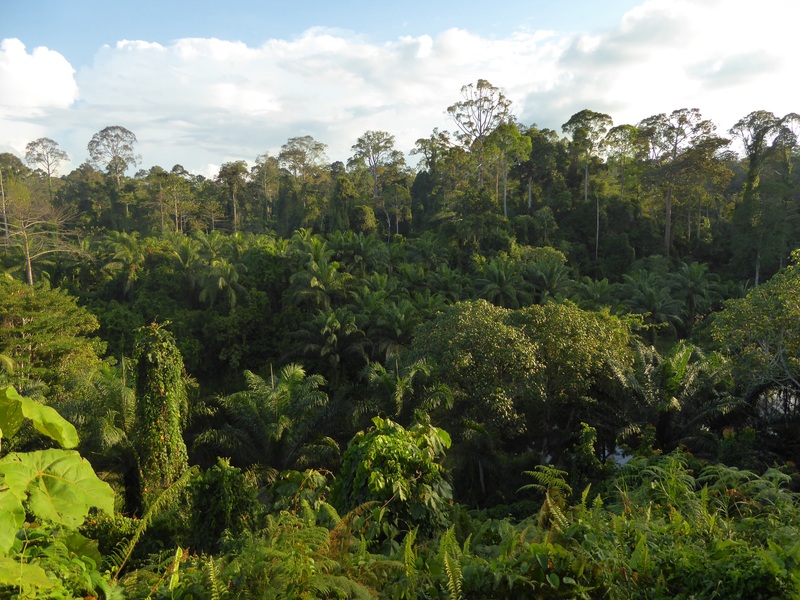 Our main reason for coming here was to visit the Orang-utan Rehabilitation Centre and the Bornean Sun Bear Conservation Centres and, to a lesser degree the Rainforest Centre. All these places are close to one another and there are plenty of places to stay within walking distance but as we were watching the pennies, we chose to stay further away at “Paganakan Dii Tropical Retreat”. Its website promoted it as being in the rainforest, which I suppose it was, technically. I have no doubt that is was quite something when it was first built 10-15 years ago but now it is getting a bit rough around the edges. Effectively, our room was a glorified garden shed and looked as though it hadn’t been swept properly since it was built. What it did have though was a wooden wall which could be slid to one side, opening up half the room to impressive views of the rainforest, the valley and the river below us. The view from our bed.. Established in 1964 to help rehabilitate Orang-utans who had been displaced by the destruction of their habitats for logging or plantations (something which is still happening now at an even faster rate!). The aim is to feed and rear the youngsters until they are eventually able to cope on their own and voluntarily return to the wild in the adjacent forest reserves which run for 6000 hectares all the way down to Sandakan Bay. The feeding sessions are when you get to see the primates up close. These are held at 10am and 3pm. We went to both. I would suggest going to the afternoon session as it is much quieter and avoids the hordes of (mostly Chinese) tour groups which, despite the instructions of the wardens, seemed incapable of keeping quiet so as not to disturb the apes. Afternoons are better time to visit much quieter and no noisy tour groups. Each feeding session starts with a warden laying out fruit on the wooden platforms. After a while the Orang-utans swing by along a series of aerial rope-ways leading to the platform. Many are mothers with their young clinging on to them. A quite magical sight to behold, although it would be even better to see them actually back in the wild! After a while we move off along the walkways to the Orang-utan nursery where the really young ones hang out. This is mainly behind glass, I suppose so as not to frighten the young ones, or perhaps something to do with preventing disease? Either way some of them had “escaped”and we’re just wandering the gardens and climbing over the buildings. Kids huh!! This is a fair walk away from the Rehabilitation Centre and is one of the prime birdwatching spots in Sabah. Not being birdwatchers, I suppose we were just killing time until our shuttle bus return but is does have a really nice canopy walk through the forest and many walking trails leading off from the centre so it would be possible to spend a lot more time here and there is certainly a lot more to offer than our brief visit allowed. This had only recently opened in 2014 and has similar objectives to the Orang-utan centre in that it aims to return the worlds smallest Sun Bears, to the wild. Somewhat less impressive than the Orang-utan centre, partly because two of the three viewing platforms were being rebuilt and I think the Sun Bears were somewhat discouraged from making an appearance by the incessant noise of the power saws being used! To be frank we did feel a little ripped off by this as it was only partly open yet they were still charging the full fee ( which was even more than the Orang-utan centre). We had almost given up on seeing any bears when they finally appeared! Cute looking animals but one look at there claws and I was really glad there was a fence between us! Sandakan has a lot of heritage, history, call it what you will. Sadly, what remains on the town’s “Heritage Trail” is not that impressive so we quickly headed off to climb up the steep hill using the “One Hundred Steps” to explore the Agnes Keith House. For some reason we decide to count the steps – 278 NOT 100! Agnes Keith was the American author of The Land Below the Wind, an autobiographical account of her life in North Borneo prior to WW11. Together with her husband Harry Keith, who was the Conservator of Forests before the war, they returned to Sandakan after internment by the Japanese occupiers, to rebuild their house. It is a beautiful house and unusually well restored. Exactly the sort of place we would like to live in if ever we moved to Asia! Well worth the 278 steps..
Close by the house we stumble across an “Olde Englishe Tea Shoppe” the like of which has sadly disappeared from our homeland many years ago. Unfortunately it was the wrong time of day for “high tea” so instead we set off back down the 278 steps for a beer!